Are you contented seeing our sala? Requesting for the next one? Well, your wish is granted! After I let you visit our sala, I will then tour you to our dinning area. Sounds yummy, smells food...food...food! I will let your appetite to judge how comfortable are you when you eat together with us. 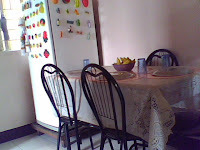 These are the variations of our dinning area. From the early days that we transfer to our new home up to the one now with decors and paintings. 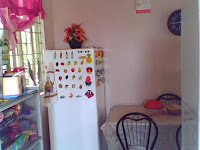 Well, these are also variations of our dinning area during day or night, preparation before and after our lunch and dinner. Of course, I won't show you our messy table right after our meal! How does it looks? Do you like it? Or do I need to put more arts in our dinning area? Do you love the colors? Or the arrangements, what will you suggest? 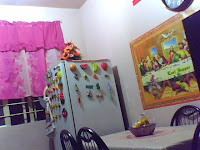 Our dinning area is just simple. But as they always say, "simplicity is beauty"! Would you agree? Or would you suggest to put more stuffs? 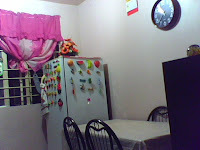 Why is your refrigerator situated beside the window. It may get wet once it rains hard. Maybe you should add more stuffs but not stuffed toys. 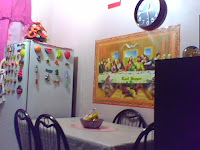 By the way, it should be dining area, not dinning area.